Do you know where your dog’s Pig Ears are sourced? Grown? Processed? Dogs love Pig Ears, and Jones’ Pig Ears are completely American sourced, grown and processed. What’s so special about American Pig Ears? 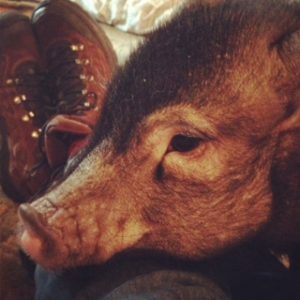 This is an American pig. Her ears are intact. And she loves the Jones’s. And why do dogs love Pig Ears so much? 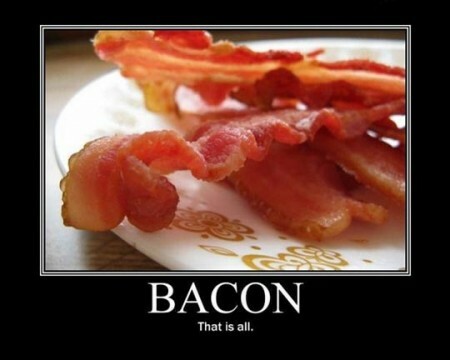 Ask yourself why you love bacon so much and you’ll be close to the answer. Here’s a better question – would you want to eat bacon that’s from another country, that may or may not have questionable ingredients? That may or may not have made other people ill, maybe even sick unto death? I sure wouldn’t. I’d be eating American bacon. Same reason I give my dogs American Pig Ears and treats. 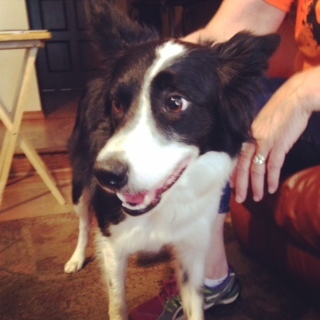 Last week I met up with a friend who has four beautiful agility Border Collies. Ty, Jet, Breeze and Annie are all black and white Borders, but all with wildly different personalities. They have one thing in common. They all LOVE the all-American Pig Ears from Jones. 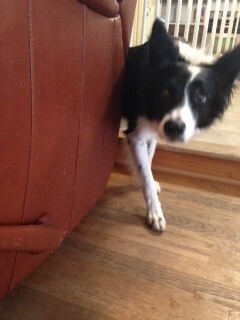 One of the Border Collies, nomming an American Pig Ear from Jones. Border Collies can be difficult to photograph, FYI. These four were in constant motion. Not only because I brought treats and OMD – PIG EARS IN OUR HOUSE! GIMME NOW!!! 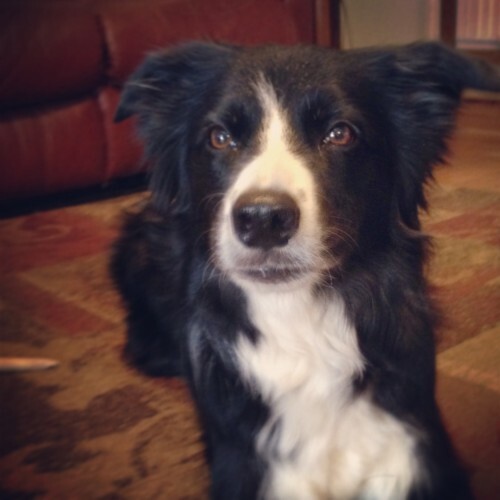 But because they’re four Border Collies in one house and all the energy that comes with them. I was trapped with four lovey, licky Energizer bunnies. Is it go time? Is it? Are there more treats? ARE THERE?!? Someday I’m going to ask my boss and Slim Doggy what those things mean. I’ve looked them up. Something to do with dry matter conversion. What I know for sure is that the Jones treats are completely grown and processed in the USA, and that they’re 100% all natural. The Pig Ear is just a pig’s ear. Nothing else. No coating, no weird stuff. The dogs all appreciate that. They can taste the difference. And it makes them smile. Jones knows how to make dogs smile, naturally. This is almost a smile. Border Collies seem to smile when they’re in motion, not at rest. The next question is always where to get all-American Pig Ears. Well, Jones, of course! Jones Natural Chews has amazing treats! Finding them is the fun part. Plenty of mom’n’pop pet stores carry Jones, as well as feed stores. Near me, Atwoods feed stores carry them. I’ve seen them in tractor supply stores. Pet boutiques across the country carry Jones. Jones’ website has a page where the stores carrying their product are listed by state. It’s not 100% updated, so just drop me a line if you can’t find your town listed. I’ll dig around and make some phone calls, find them for you. 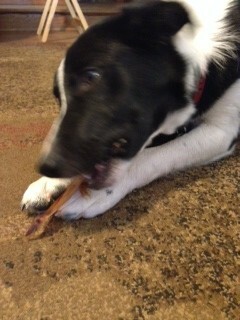 If all else fails, Natural Dog Treat Shop carries the complete line of Jones Natural Chews and they ship to your door. Always a good option. Are there any Jones Pig Ears left? I’m just checking. For my sister. Yeah. My sister. So! Make your dog smile! 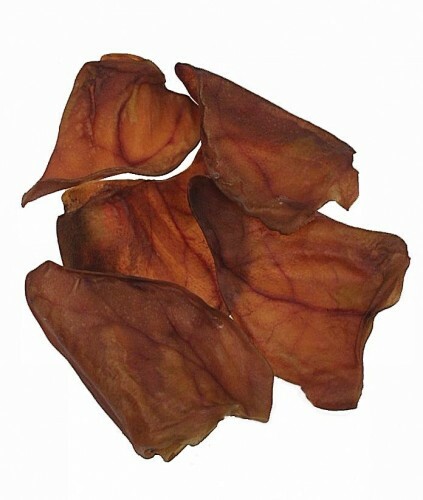 Give it an American Pig Ear from Jones Natural Chews. You’ll be glad you did.